This tutorial builds on the simple Microservice application that we built in the previous tutorial. Everything looks good so far, but what happens when we release this to production, and our application is consumed by multiple customers? Routing problems and message-correlation issue begin to rear their ugly heads. Our current example is simplistic. Consider a deployed application that performs work that is much more complex than our example. 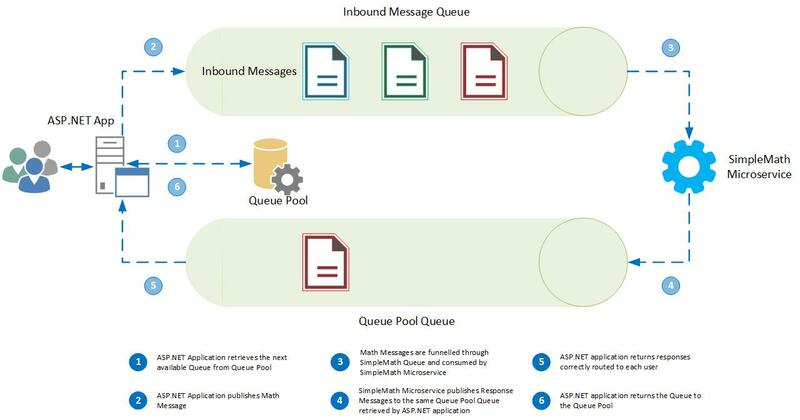 It is possible that outbound messages published from the SimpleMath Microservice may not arrive at the ASP.NET application in the same order in which the ASP.NET application initially published the corresponding request to the SimpleMath Microservice. RabbitMQ has built-in safeguards against this scenario in the form of Correlation IDs. 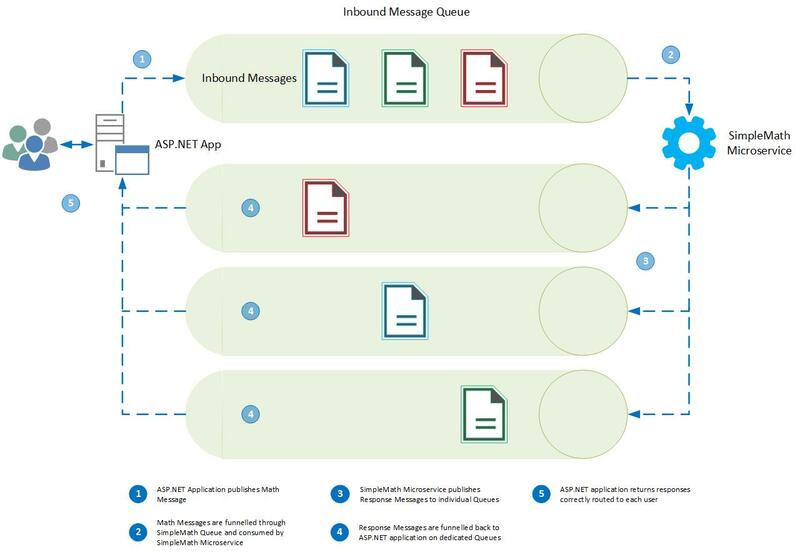 A Correlation ID is essentially a unique value assigned by the ASP.NET application to inbound messages, and retained throughout the entire process flow. Once processed by the SimpleMath Microservice, the Correlation ID is inserted into the associated response message, and published to the response Queue. What’s wrong with this solution? It’s possible that any given message may be bounced around indefinitely, without ever reaching its intended recipient. Such a scenario is unlikely, but possible. Regardless, it is likely, given multiple Microservices, that messages will regularly be consumed by Microservices to whom the message was not intended to be delivered. This is an obvious inefficiency, and very difficult to control from a performance perspective, and impossible to predict in terms of scaling. But this is the generally accepted solution. What else can we do? Whoa! Are you suggesting that we create a new Queue for each request?!? Yes, so let’s park that idea right there – it’s essentially a solution that won’t scale. We would place an unnecessary amount of pressure on RabbitMQ in order to fulfil this design. A new Queue for every inbound HTTP request is simply unmanageable. QueuePool is a static class that retains a reference to a synchronised collection of Queue objects. The most important aspect of this is that the collection is synchronised, and therefore thread-safe. Under the hood, incoming HTTP requests obtain mutually exclusive locks in order to extract a Queue from the collection. In other words, any given request that extracts a Queue is guaranteed to have exclusive access to that Queue. The list of returned Queue objects is filtered by name, such that only those Queues that are named in GUID-format are returned. QueuePool expects that all underlying Queues implement this convention in order to separate them from other Queues leveraged by the application. Notice the Get method. An attempt is made to retrieve the next available Queue. If all Queues are currently in use, QueuePool will create a new Queue. Leveraging QueuePool offers greater reliability in terms of message delivery, as well as consistent throughput speeds, given that we no longer need rely on consuming components to re-queue messages that were intended for other consumers. It offers a degree of predictable scale – performance testing will reveal the optimal number of Queues that the QueuePool should retain in order to achieve sufficient response times. It is advisable to determine the optimal number of Queues required by your application, so that QueuePool can avoid creating new Queues in the event of pool-exhaustion, reducing overhead. This entry was posted in AMQP, ASP.NET, C#, Message Queueing, Microservice Architecture, Performance Tuning, RabbitMQ and tagged .net, amqp, ASP.NET, C#, csharp, distributed design, message, microservice architecture, optimisation, optimization, performance, queuing, rabbitmq on July 31, 2015 by Paul Mooney. The difference between QueuePool and Topic concepts is that QueuePool can grow and shrink (I’ll cover this in a future post) dynamically, whereas Topics are predefined and tightly-bound to Queues through routing keys. This makes achieving a similar concept with Topics a more cumbersome process that requires manual scale. Fair enough but i want the fewest message types as possible. I would want messages rejected if they don’t fit the predefined topics. If i want dynamic processing I’ll have a reusable envelope and allow the content to vary. Interesting use-case. Surely you can handle message-rejection at a publisher level, before the message is dispatched. By dynamic processing, I mean automatically scaling the pool of available Queues when the pool reaches exhaustion. The message format, in this case, is out-of-band.